Another penalty to NZ now on halfway this time. Aussie forwards pinged for leaving feet. Carter will have a shot at goal and it's a long one. Hoping there won't be any yellow cards tonight. Last week was enough for several games! It was 49 metres and he fell just short. Wallabies drop out from their 22. Five minutes to go in the first half. A messy phase ends with a penalty to the Wallabiues deep in their own half. Up in northern Norway using my trusty samsung 5.to getting every scrap of info from you guys .ABs by 20...love NZ Herald..
White kicks for touch and finds it near halfway. Great kick from a narrow angle. Wallabies win the lineout and try to drive up the blindside but Dane Coles is there to clean it up. 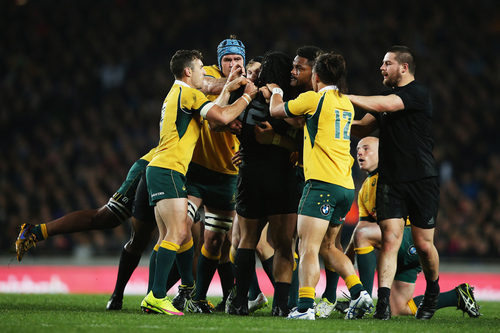 Under two minutes to go and the Wallabies have a lineout on the ABS 22. Turnover ball. The All Blacks have won a scrum. Penalty to the All Blacks now with just seconds remaining in the half. Carter sends a huge kick into the corner. The All Blacks will have the last play of the half. Carter tries a drop kick but it's away to the left. Thanks for the feed guys. Boarding my flight home from Tegle Berlin. Will have to catch the result in Abu Dhabi if I can! The All Blacks are good for their halftime lead after excelling in patches. 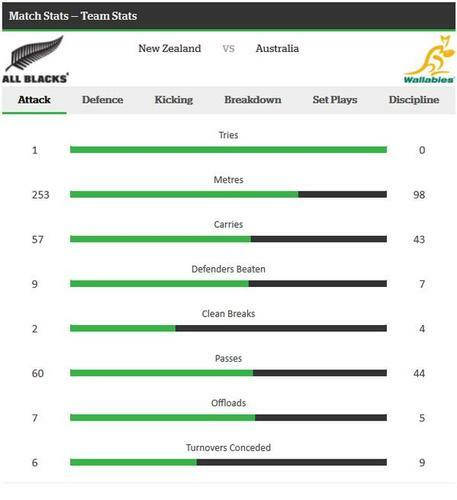 Aussie dominated the first 10 minutes and went 3-0 up, but the All Blacks fought back well. 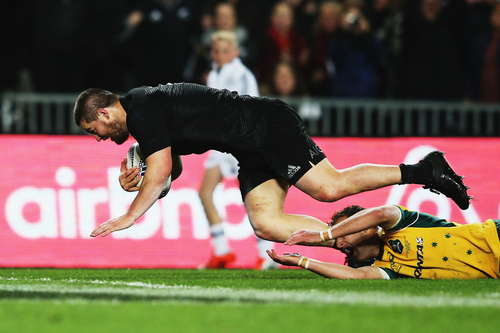 The moment of the half started with a Dan Carter step and was finished off by a turbo-charged Dane Coles. Carter has had a great match, slotting all three of his kicks. Vito and Coles playing well? interesting, could maybe do with more Hurricanes less Crusaders in that forward pack perhaps? How have carter and miller scudder gone in the first half? Carter has been excellent. Milner-Skudder has hardly featured. 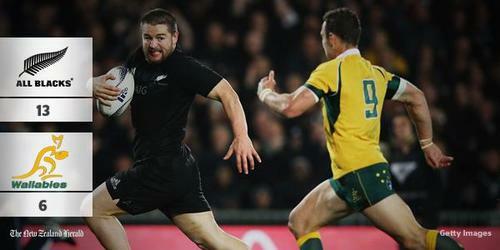 Milner-Skudder has made three carries for a total of 21 metres. Aaron Smith has been solid without being spectacular. Much better than last week. Steve - Did you ever get that $5k bet slip that the aussie guy was saying he got? Woohoo All Blacks!! I am in Germany and obviously not getting full feed as thought the Ab's were behind. Nice to see the half time score!,! hoping cane can get on in the 2nd half.aaron smith was not upto his usual standards.messam had a shocker.not even a good water boy. Tequila shots for every AB try in Mexico, still pretty sober!! Though Danes try was worth a double. Am in Townsville, North Qld. Listening to Nigel Yalden's commentary on Radio Sport and monitoring this. Great work guys, GO the Mighty AB's!! Cheers for the live feed,only way I can follow the game live ,two kiwi saturation divers in decompression out in the gulf of Thailand. Watching from Düsseldorf. Love the blog. My lifeline for last week's game while driving back from Tuscany. We're back underway as Quade Cooper kicks deep down to MIlner-Skudder. Carter clears down the middle, Folau returns fire and then Ben Smith kicks to Cooper. The Aussie No.10 slips over as he bends down to catch the ball and the crowd go wild. They love that. He recovers well to clear for touch. All Blacks lineout.